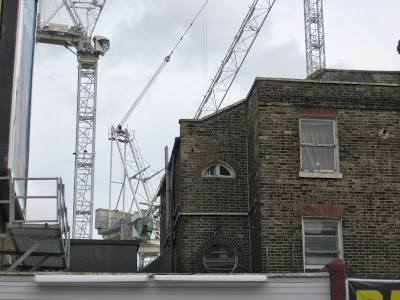 The appearance of bulldozers behind the Georgian terrace at 48-76 Dalston Lane prompts questions about the wisdom and legality of the Council's intention to demolish these significant buildings and provokes last ditch endeavours to save them. This event will unravel a sad tale of the neglect and abuse of our local businesses and heritage assets, question the long-term wisdom of the obliteration of old Hackney and discuss our community's response in the context of a borough caught up in an tsunami of "regeneration". Emma-Louise Williams' film UNDER THE CRANES (2011) 56 Mins 12A will be screened. Mixing rarely seen archive footage with new cinematography, Under the Cranes offers a lyrical, painterly evocation of Hackney, over several hundred years. This is a film which poses questions about the nature of regeneration in Hackney in the recent period. It also explores the theme of migration, showing some of the struggles that people go through to secure a place for themselves, (fighting racists if necessary), but also how migration brings diversity and the seeds of renewal. Based on Michael Rosen’s poetic play for voices, Hackney Streets, the film moves across time and space as we hear from Shakespeare in Shoreditch, a Jamaican builder, a Turkish barber and the 43 Group taking on Oswald Mosley in Dalston. SPEAKERS will include Bill Parry-Davies, the Hackney solicitor, musician and founder of OPEN Dalston, presenting his photographic record of the decline of the Dalston Lane houses. Bill explains the course of events that has culminated in the inevitable attempts by the owners to erase this historic terrace, and similar examples, for short term commercial gain in the name of necessity and progress.